Few could have expected such a wonderful atmosphere and a fantastic response from Equatorial Guinea’s national football team – the Nzalang on the opening game of the Africa Cup of Nations in Bata. The country is flying after its national team beat Libya 1-0 in the first game of the tournament being jointly hosted by Equatorial Guinea and Gabon. It has been a whirlwind few days in Malabo and Bata as the preparations for the tournament reached their culmination. Teams have been arriving from all over Africa over the last few days, with Northern Sudan, Libya, and Burkina Faso based in Malabo. With many of the traditional Goliaths of African football missing – Cameroon, Nigeria and South Africa – there is a feeling that it could be the year that the smaller nations, the David’s of the continent, make a mark on the bi-annual tournament. The opening games were no exception with the players selected by Brazilian coach, Gílson Paulo, responding accordingly. Ranked 151st in the world, few outsiders expected Equatorial Guinea to make much of an impression in their first appearance in the tournament. Losing their coach a month before the competition was not seen as the best way to prepare for their Cup of Nations debut but once again this country has managed to confound its critics. The team fought like lions throughout and finally got the goal they deserved with five minutes left. Both the team and its passionate support have been walking on air ever since. As if to underline the giant-killing atmosphere at this tournament little old Zambia, recorded a historic 2-1 victory over Senegal in the following game. The stage was set for the team’s heroics by a glittering opening ceremony in the gloriously refurbished Nkoantoma stadium that left little doubt that this small nation was taking its responsibilities as the host nation seriously. The 40,000 spectators lucky enough to get a ticket for the opening spectacle were treated to a cultural smorgasbord that included a two-hour concert that featured local artists Anfibio, Besoso, Poen, Sandra Star, Yuma and Pili la Peligrosa. A generous offer of a $1m bonus for a win in the first game may have been at the back of the players’ minds, but a team put together at short notice was undoubtedly moved more by the uplifting atmosphere within the stadium and the outpouring of national pride that comes with such events. I haven’t lived here long but there can’t have been many happier days in the country’s history than this one. Long live the Nzalang! Bring on Senegal and Zambia. The countdown to the Africa Cup of Nations has begun in earnest following the draw for the competition in Sipopo yesterday. 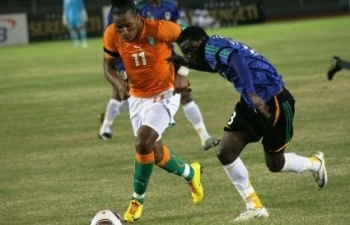 Equatorial Guinea and its neighbour Gabon will host the competition for the first time in January / February 2012. All the facilities are almost in place to host what promises to be a fantastic football celebration that will help visitors from all over the region to experience the world’s most misunderstood country. Both countries are well advanced in their plans to host the 16 teams that qualified for the 28th version of the tournament. Stadiums in Malabo and Bata, Equatorial Guinea’s main cities are well ahead of schedule and while Gabon appears to be behind its neighbour it expects to have its facilities in Libreville and Franceville ready ahead of kick-off on January 21, 2012. Equatorial Guinea will play Libya in the opening game followed by Senegal and Zambia in the country’s second city of Bata. Games will be played in the 40,000-seater stadium in Bata, the largest city on Equatorial Guinea’s mainland. The decision to hold the home country’s games on the mainland promises to create a fantastic atmosphere in a city that has been transformed in recent times. The Ivory Coast, Sudan, Burkina Faso and Angola will play their games in the New Stadium in Malabo. Built by the French contractor, Bouygues, the 15,250-seater stadium was host to Equatorial Guinea’s first triumph at this level, the victory of the women’s team in the 2008 female equivalent of the competition. The other two groups of four: Group C; Gabon, Niger, Morocco, Tunisia and Group D; Ghana, Botswana, Mali, Guinea will play theirgames in Libreville and Franceville respectively. It is a statement of Equatorial Guinea’s progress that it is now ready and willing to hold such events. It would have been unthinkable for the country to have held the competition as little as five years ago but the progress that has been made in terms of road, airport and port infrastructure as well as the construction of four world-class hotels all ensure the competition’s success. Unfortunately for the spectacle and the organiser’s hopes of attracting the maximum number of visitors to the tournament, the list of teams present in this year’s draw lacks some of the country’s illustrious neighbours. In particular neighbours Cameroon and Nigeria will be missed as both football nations with a track record of success in the CAN and World Cups and as a valuable source of visitors. While Samuel Eto’ and Obafemi Martins will be sorely missed on the pitch their fans will be an even bigger loss to the tournament. At times too much can be read into football and the parallels with power and economics but the absence of the continent’s most powerful nations appears to reflect something of a seismic shift in the region. The presence of smaller nations like Burkina-Faso, Mali, Botswana, Niger and Guinea Conakry in Equatorial Guinea and its neighbour Gabon all reflect a broadening of the continent’s power base. You don’t have to look any further than the hosts, Equatorial Guinea and Gabon, two great examples of the new wealth distribution and subsequent power blocks developing in the region. After a successful stint as president of the Union of Africa, Equatorial Guinea is determined to build on its time in the spotlight and is using its oil wealth accordingly. With the world’s eyes turned on one of the most emotional of football competitions, the country is determined to show off more than just its excellent infrastructure in particular it wants to demonstrate its success in delivering peace in one of the world’s most violent continents. Equatorial Guinea has been free from the security concerns that overshadowed the competition in Angola in 2010. Two of Togo’s squad were tragically killed during the last tournament in Angola after rebels from the province of Cabinda attacked the team bus. As a country that has no internal security issues, Equatorial Guinea is almost an anomaly in Africa. While even its neighbours suffer from piracy and terrorism, Equatorial Guinea has been at peace since president Teodoro Obiang overthrew his uncle Francisco Macias in 1979.